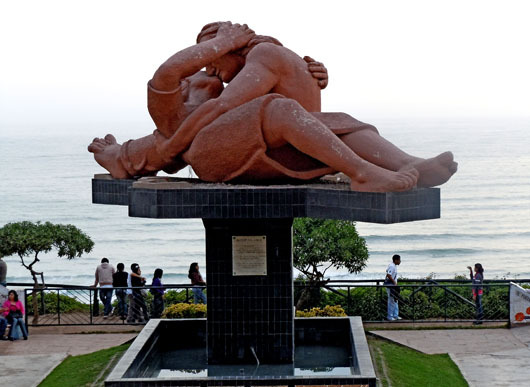 The lovely Parque del Amor overlooking the Pacific ocean in Miraflores, Lima is surrounded by undulating walls, on which are romantic quotes by well known Peruvian poets, scripted in mosaic tiles. In the centre of the park is this sculpture called ‘El Beso’ – meaning eternal kiss – depicting the sculptor Victor Delfin and his wife locked in a passionate embrace! Hahaha……..love this, Madhu. Great take on the theme. Happy weekend to you too. Made me laugh! Perfect entry! That’s beautiful sculpture, that I hadn’t seen before and the perfect choice for the theme. Very close and very romantic! Great one! Says a lot about the “close”… Nice shot! Perfect for the challenge Madhu! Glad you think so Lynne 🙂 Thank you. That IS close!! 🙂 What a fascinating sculpture. Close indeed. Perfect for the challenge. Shantala and Shaantz, Shantha and Shaanthz – pretty close….back in college days, friends called me Shaanthz and it has stayed on. Glad you do TBM 🙂 Thank you. Really cool! I was only in Lima one day but t wasn’t a good one as I got mugged! Then we were off to the Inca trail and everything got better! Unfortunately the experience tainted my view on Miraflores where it happened at night. Oh Nicole, that must have been traumatic! I can imagine why that tainted your perception of Miraflores. Hope you didn’t lose anything of value. Wow, that is one BIG KISS!! Nice shot! Wow! That is one unforgettable kiss. Close and amazing! Close enough is right! Lovely sculpture….and love prevails! Madhu…every time I come to your blog, you have the most amazing photos and you’ve been to the most incredible places! I stand in awe of what you show us. Thank you so much! Truly appreciate that Judy! Thank YOU for your generous support. Peace, love and light to you as this is a perfect photo for this week!! Fun post – interesting sculpture! !